All 18 World Wide Stereo coupons have been verified and tested today! World Wide Stereo has a strong price matching policy. You can have a one-time price match issued if you purchase an item, and it’s advertised by World Wide Stereo or an Authorized Dealer for a lower price within 30 days of your purchase. You will be refunded the difference between the price you paid at World Wide Stereo and the advertised price, taking into account any World Wide Stereo coupon code or other offers used on your purchase. Each item can only be price adjusted once. To get started with a price adjustment, contact World Wide Stereo customer service at 1-866-961-7781. At World Wide Stereo, you have the option to pay with a credit or debit card, and you may also qualify for special financing offers, which are ideal for purchasing an expensive home theater system or another product. Shoppers at World Wide Stereo can choose to finance their purchases through Affirm, which allows customers to split their purchases into 3, 6, or 12 monthly payments, at an APR of 0-30%, depending on creditworthiness. Blispay is also available. This Visa card can be used anywhere, and no payments or interest are required on purchases of over $199, as long as they are paid off within 6 months. World Wide Stereo also offers in-store financing options. You can stop by a store, or call customer service to learn more about your other options for financing your purchase. You don’t need a World Wide Stereo coupon code to save on shipping fees. The company offers free shipping on all orders of every size. To make sure you don’t pay shipping fees, ensure that you select “Standard” shipping when checking out. For expedited, 2-day, or next-day shipping, you’ll have to pay an extra fee. If you’re an active-duty member of the military, a veteran, retired, or the immediate family member of a military serviceperson, you’re eligible for a 5% discount at World Wide Stereo with id.me. Simply sign up, claim your single-use code, and use it when checking out to save 5% on your entire order. Want to see what’s on sale at World Wide Stereo? You can browse all of this week’s best deals by clicking the “Deals” or “Holiday Deals” button on the navigation bar. The name changes seasonally. Then, you’ll be able to browse savings in a number of different categories, including Car & Marine Audio, Home Audio, TV & Video, and Headphones & Wireless. With the right World Wide Stereo discount code, you can get a great deal on your next purchase. Take a look at the offers we have on CNN Coupons, and see how much you can save. Want to save on your next order? Looking for a World Wide Stereo promo code to use? If you sign up for email messages, you can get a 5% off World Wide Stereo promo code, and also get free shipping on your order. 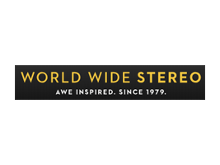 To get your World Wide Stereo coupon, just head to the World Wide Stereo website. Then, scroll to the bottom of the page, and enter your email in the text field on the bottom-right. Then, just press “SIGN ME UP” to complete the email sign up process. Now you’ll get deals, discounts, and special promotions from World Wide Stereo sent directly to your inbox. World Wide Stereo has a strong return policy, due to its 60 day Money Back Guarantee. If you are unsatisfied with the quality of the product you purchased, you can return or exchange it within 60 days, as long as it’s in the original condition and includes the original packaging. To return a product, you will need an RMA, which you can get from a customer service representative at 1.866.961.7781, or online via email. Then, pack the item and secure it in the original box, complete with all accessories, manuals, and other included items. It’s recommended to “double box” your item to protect it during transit if it’s fragile. Remove or cover the old shipping labels, and ship it to the World Wide Stereo returns center, along with your RMA. Your refund will be issued to your original method of payment within 3 days of receiving your item, minus any applicable restocking fees. Found a World Wide Stereo coupon you’d like to use? Wondering how? Here’s what you’ll need to do to get started. 4. Continue checking out to finalize your purchase and save.